Nonument: Mapping and Archiving Public Space is a two day symposium addressing questions of public space in Eastern and Central Europe, as well as the US and the Middle East. Non-transparent approaches to space and fast and radical interventions to city plans, are traits of intense diminishing of public space. The latter also poses questions on specifics of architectural heritage and heritage in general. The term Nonument denotes 20th century architecture, monuments and public spaces that have undergone a shift in symbolic meaning or had lost it, as a consequence of political and social changes. Among other, Nonuments are monuments of previous regimes or public spaces of a post-socialist context. The two days symposium addresses the public/common through the lens of space and connects it to historical dilemmas of transitions, while engaging with possibilities of re-use and re-purpose through artistic interventions. 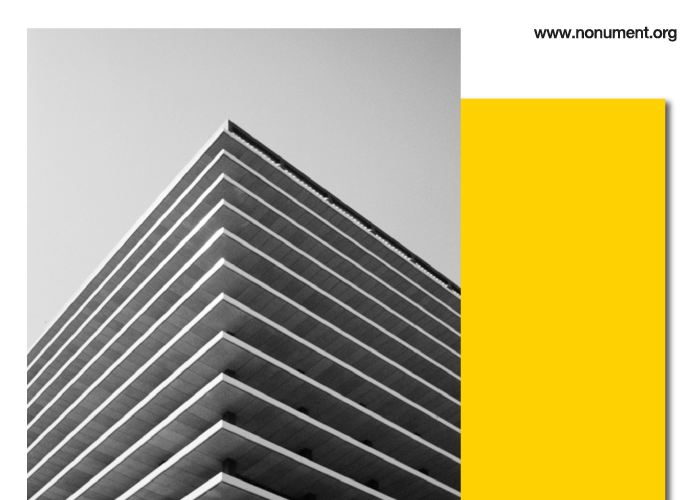 Nonument is simultaneously a name for MoTAs research platform that archives, discusses and maps architectural heritage, monuments and 20th century public space. The platform is home to the international NONUMENT Group that addresses public spaces value and problematises unsustainable approaches to architectural heritage with artistic actions. One of them, Nonument 01::The McKeldin Fountain, took place in Baltimore (US). The Fountain was one of the rare public spaces in the city, and has been demolished despite protests. The resulting AR app is a virtual memorial and a collection of interviews with the fountain users. Among an international array of speakers, we will host philosopher Alexei Monroe, architect Miloš Kosec, Bellastock collective member Simon Jacquemin, editor of Oris magazine Maroje Mrduljaš, National Museum of Contemporary History director Kaja Širok, and art historian and Aggregate co-founder Pamela Karimi. Full program, more info and registration coming soon! Nonument symposium is part of MAPS – Mapping & Archiving Public Spaces, a project devoted to a deeper understanding of architecture, public spaces and monuments of the 20th century. It deals with spaces that have gone through a process of transformation within which they have acquired a new meaning. MAPS builds a digital landscape with in-depth research on Nonuments, including 3D scans and oral histories, collected within the community. MAPS develops an interdisciplinary methodology for preserving Nonuments and builds open-source tools for community engagement in the inclusive online database and map. MAPS – Mapping & Archiving public spaces is a cooperation project, co-financed by Creative Europe.